Alton Ellis is one the finest soulful voices to come out of Jamaica. As well as writing hit singles himself, he could make a cover version known as a foreign tune sound like a Jamaican reggae tune with the greatest of ease. As the more upbeat rhythms of the earlier "ska" period began to slow down around the turn of 1966 some say due to the extreme heatwave that hit the island of Jamaica that year, slower rhythms suited the people to groove to at the various sound systems and dances. This also allowed the singers to express themselves more and allow the song to shrine through. No one did this better than Alton Ellis. 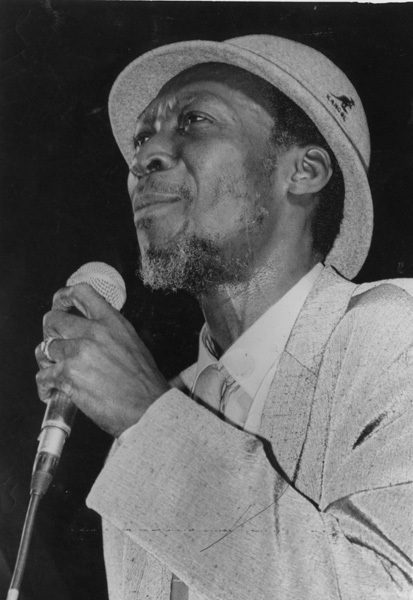 Alton Ellis (b.1944, Kingston, Jamaica) started off singing at an early stage as part of a duo with singer Eddie Perkins and recorded for both Studio One and Randy's as Alton and Eddy and had a massive hit with the song "Muriel". 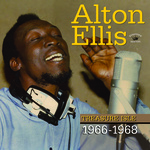 The singing pair went their separate ways with Alton going solo with Studio One and being a much in demand voice also recorded with Duke Reid's Treasure Isle Studio as Alton Ellis and The Flames. As stated earlier, as the beat slowed down the top singers shined through, and Alton Ellis reigned supreme. One of his tunes featured on this set, "Get Ready (Do The Rocksteady)", even gave this period in reggae's history its name "rocksteady". It's this fantastic period in rocksteady, 1966 to 1968, that Kingston Sounds feature on this release. This set carries all the big hits "Ain't That Loving You", "Girl I've Got A Date", "Cry Tuff", alongside many more classics. All the cut at Treasure Isle songs that really defined the era. So sit back and enjoy the Rocksteady sound at its finest. Enjoy the set. Features Phillis Dillion. CD version includes three bonus tracks. LP version. Alton Ellis is one the finest soulful voices to come out of Jamaica. As well as writing hit singles himself, he could make a cover version known as a foreign tune sound like a Jamaican reggae tune with the greatest of ease. As the more upbeat rhythms of the earlier "ska" period began to slow down around the turn of 1966 some say due to the extreme heatwave that hit the island of Jamaica that year, slower rhythms suited the people to groove to at the various sound systems and dances. This also allowed the singers to express themselves more and allow the song to shrine through. No one did this better than Alton Ellis. Alton Ellis (b.1944, Kingston, Jamaica) started off singing at an early stage as part of a duo with singer Eddie Perkins and recorded for both Studio One and Randy's as Alton and Eddy and had a massive hit with the song "Muriel". The singing pair went their separate ways with Alton going solo with Studio One and being a much in demand voice also recorded with Duke Reid's Treasure Isle Studio as Alton Ellis and The Flames. As stated earlier, as the beat slowed down the top singers shined through, and Alton Ellis reigned supreme. One of his tunes featured on this set, "Get Ready (Do The Rocksteady)", even gave this period in reggae's history its name "rocksteady". It's this fantastic period in rocksteady, 1966 to 1968, that Kingston Sounds feature on this release. This set carries all the big hits "Ain't That Loving You", "Girl I've Got A Date", "Cry Tuff", alongside many more classics. All the cut at Treasure Isle songs that really defined the era. So sit back and enjoy the Rocksteady sound at its finest. Enjoy the set. Features Phillis Dillion. "Filmed & Recorded At The Jazz Cafe, Camden Town, London, 10th August 2008 at Alton Ellis's final show. He died two months later at Hammersmith Hospital." Radiation Roots present a reissue of Alton Ellis's Love To Share, originally released in 1979. One of Jamaica's most highly-rated vocalists, Alton Ellis made an incredible contribution to the island's popular music. Blessed with a particularly emotive voice that brings shivers to the spine, whether singing original material or cover tunes, Ellis was born and raised in Trench Town, the west Kingston ghetto area that gave rise to Bob Marley and the Wailers and countless other singers. Ellis and singing partner Eddie Parkins hit big in 1961 with the ballad "Muriel" for Coxsone Dodd, and after Parkins moved to the USA, Ellis teamed briefly with John Holt, and then began fronting the Flames harmony group. He excelled in the rocksteady style, christening the genre with "Rock Steady" and "I Have Got A Date", bouncing between Studio One and Treasure Isle for a number of years. From 1971, he spent increasing period in London, but continued to record hits in Jamaica for various producers. 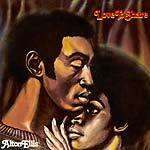 The 1979 release Love To Share was arranged by the great Studio One keyboardist Jackie Mittoo, who co-produced the album with Junior Lincoln, founder of the London-based Bamboo label; the disc straddles the line between lover's rock and roots reggae, remaining a lesser-known classic. LP version. Radiation Roots present a reissue of Alton Ellis's Love To Share, originally released in 1979. One of Jamaica's most highly-rated vocalists, Alton Ellis made an incredible contribution to the island's popular music. Blessed with a particularly emotive voice that brings shivers to the spine, whether singing original material or cover tunes, Ellis was born and raised in Trench Town, the west Kingston ghetto area that gave rise to Bob Marley and the Wailers and countless other singers. Ellis and singing partner Eddie Parkins hit big in 1961 with the ballad "Muriel" for Coxsone Dodd, and after Parkins moved to the USA, Ellis teamed briefly with John Holt, and then began fronting the Flames harmony group. He excelled in the rocksteady style, christening the genre with "Rock Steady" and "I Have Got A Date", bouncing between Studio One and Treasure Isle for a number of years. From 1971, he spent increasing period in London, but continued to record hits in Jamaica for various producers. The 1979 release Love To Share was arranged by the great Studio One keyboardist Jackie Mittoo, who co-produced the album with Junior Lincoln, founder of the London-based Bamboo label; the disc straddles the line between lover's rock and roots reggae, remaining a lesser-known classic. 2015 repress. Alton Ellis is undoubtedly the greatest soul singer of the '60s Jamaican invasion. Tracks: "Reason In The Sky," "Black Man's Pride," "Darling It's True," "Day Dreaming," "Earth Needs Love," "Sinners Gonna Weep," "Changes," and "Stronger Than Before." The same album as Changes; different cover art, shorter hair.